TV Size Up to 65"
Solid and straight forward, apart from the comment below. TV is very close to the wall, which is what we wanted. Easy to fix and secure. I personally can’t fit this myself but have someone coming to do it. I’ve checked the VESO (400x200), but these are the only 4 screws in the back of my tv, in the lower quarter, and are in the corners of a “sticking-out” box-type fitting that has all ports for hdmi, scart, mains etc. Is this the right place to attach the bracket (vertical arms) to? 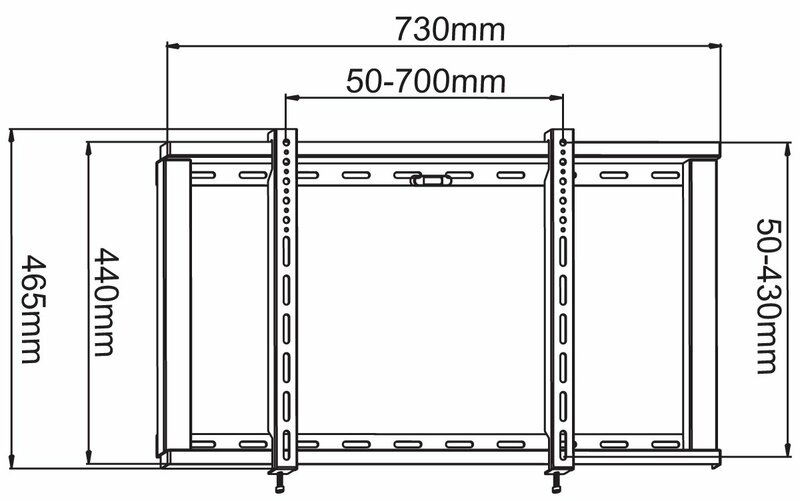 And will I need to cut/saw off some bracket arms that will therefore be visible behind the tv when mounted on wall? 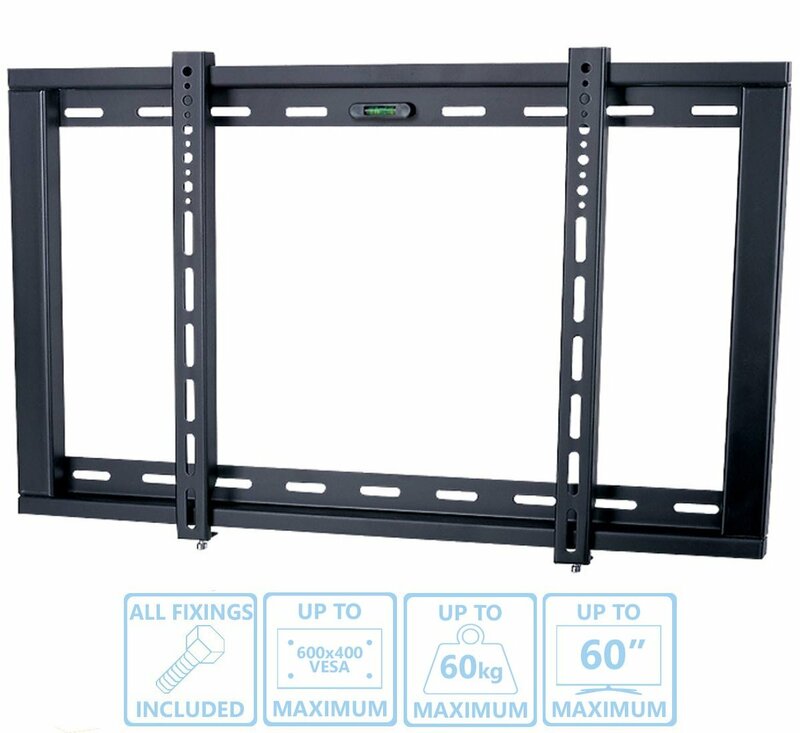 Hi, it's been some time since I used this but usually there are several holes on the bracket that allow it to be positioned higher so the top holes of your 4 on the tv will go into spaces lower on the bracket thus lifting the bracket higher up on the back of your tv but not seen above it. As long as the holes they use for the top still allow them to use the bottom ones, the bracket can move up and down to allow the best access at your plugs. As long as the four screws go through a space in the bracket then you will be ok.
Wall mounted socket and plug will fit behind the TV. You will have to plug in before mounting the TV on the frame. Yes to all. 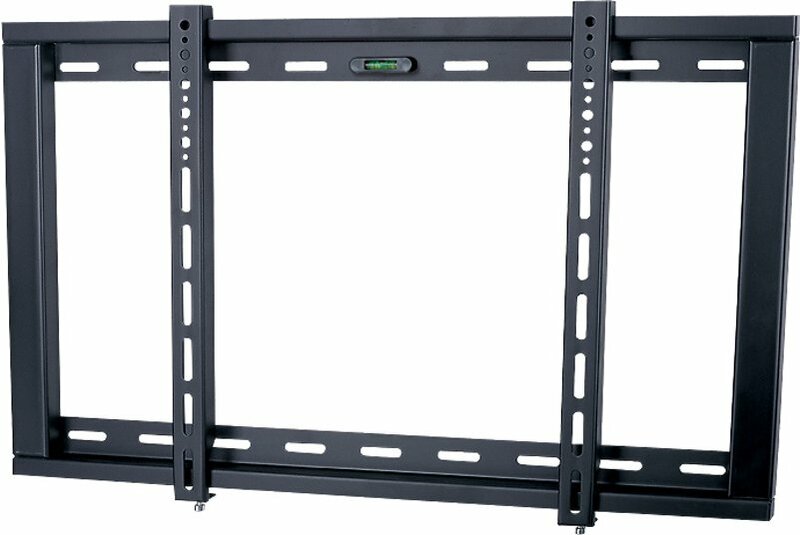 I have a 40" TV attached using this bracket and I have scart, hdmi, lan and av leads all connected at the back. It's a snug fit but nothing is bent. The bracket is excellent quality for the price and I even recommended to my sister as she wanted the same setup in her house. does this unit come with all the tv fixings? yes it does ,, it comes with alot of extras for the different t. v. models but remember it is for the wall bracket. Can I fit it in a plaster board wall and what should I need to make it safe and solid. Thank you. Jonathan is right what he has written. I believe the wooden uprights should be able to take the weight, however I live in an internal brick build house of the early 1950's and therefore have no real knowledge regarding your question.